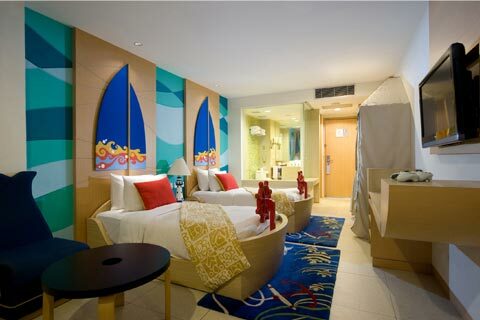 Carefully designed with families in mind, our 75 sqm KidSuites® offers a colorfully themed kids’ room connected to a separate bedroom for adults and other family-friendly facilities for a more relaxing and enjoyable holiday for both parents and children. The kids’ section of the suite comes equipped with twin-sized beds and a play corner, including a flat screen TV, a DVD player, a game console, ensuring the kids enjoy their entertainment in their own space. BEDS : One king bed and two single beds. OCCUPANCY : 2 Adults and 2 children. EXTRA BED : One rollaway bed. CONNECTING : Applicable for this room type. 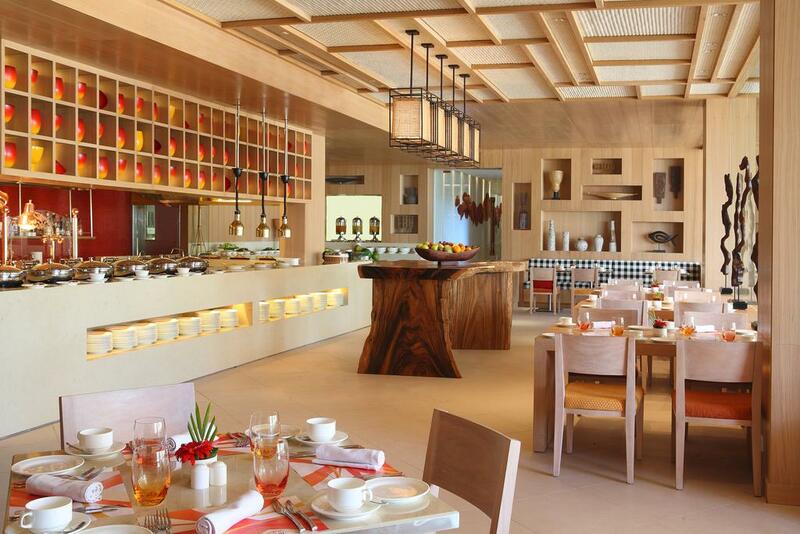 At our resort, Kids Stay and Eat Free*. Featuring Rascals Kids Club, where your kids will want to go again and again. WiFi Internet access is available throughout your room. Work desk & In-room safe. Bathroom with power shower and hair dryer. Featuring plush beds in a king or twin configuration, each of these 36sqm contemporary rooms is located on the ground floor with easy access to the resort’s Swimming Pools. 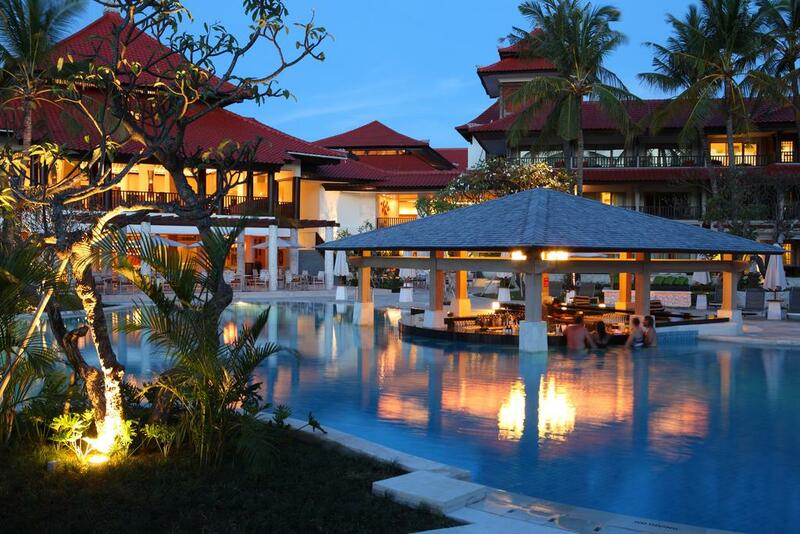 Parents may enjoy the warm island breeze and savor fresh drinks at the Pool Bar while being at a close distance from the kids who might be having fun time in the airy private balcony of the room or in the lush tropical garden surround pool area. BEDS : One king bed or two single Beds. OCCUPANCY : 2 adults, or 2 children, or 1 adult & 1 child. 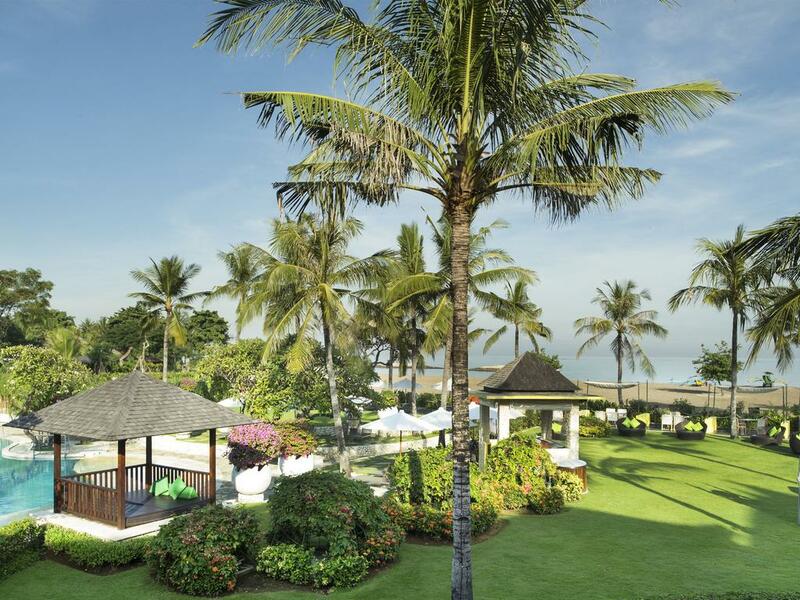 CONNECTING : Connecting rooms are possible based on availability making Holiday Inn Resort® Baruna Bali one of the best family hotels in Bali. At our resort Kids Stay and Eat Free. We feature Rascals Kids Club, where your kids will want to go again and again. 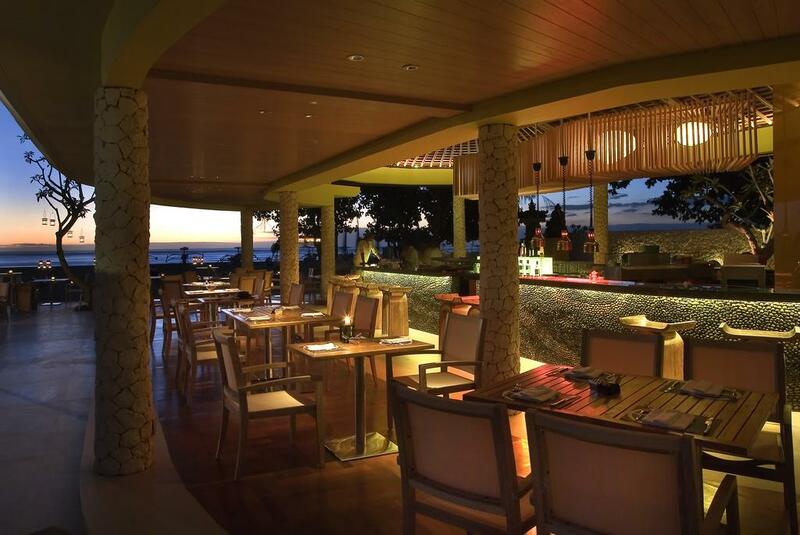 FOR COUPLES : Soak up in refreshing island breeze with your loved one at the private balcony with chaise lounge. Indoor sitting area and beach slippers. 32" flat-screen TV with more than 60 channels. 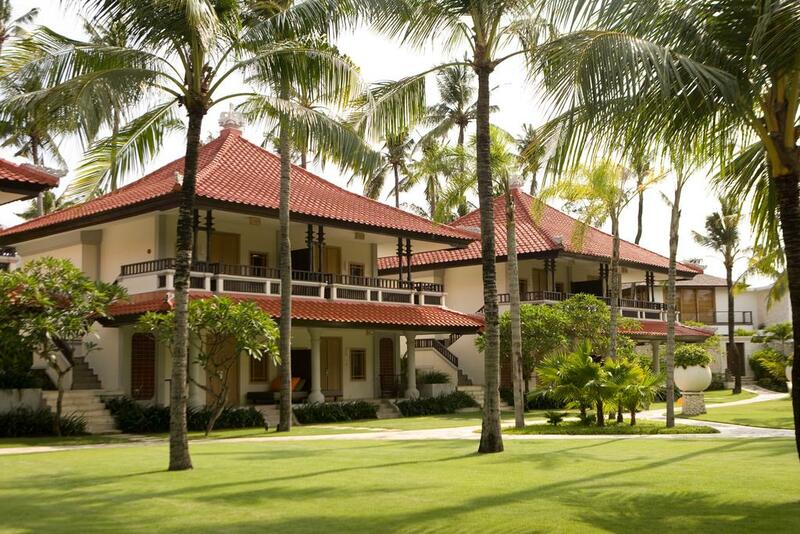 ​Set amid the resort’s lush greenery, each of these 50 sqm contemporary living space offer an ideal choice of cozy family retreat in the tropical island. With easy access to a spacious private balcony extended to our serene garden, each room feature a king-sized bed, a sofa bed and a separate bedroom with fortress-like bunk bed and Wii, so the kids can have their own space. The floor-to-ceiling windows allow plenty of natural light to pour onto the rooms, while the spacious private balcony with cushy daybed allows you and the kids to spend breezy afternoons with endless fun-filled family moments. BEDS : One king bed, one sofa bed, and bunk beds. OCCUPANCY : 2 adults & 3 children, or 3 adults & 2 children, or 1 adult & 4 Children. EXTRA BED : Not applicable for this room type. At our resort Kids Stay and Eat Free*. Boasting 78 sqm of living space, our Bigroom Pool Garden offers you spacious and comfortable accommodations for the whole family. When it’s time to sit back and relax, easily access the resort’s swimming pool s from its spacious private balcony enjoy the endless fun-filled family moments with the kids while spending the breezy afternoons in the gentle sway of the porch swing. BEDS : One king bed, one single bed, and one sofa bed. EXTRA BED : 1 rollaway bed. CONNECTING : Not applicable for this room type. Limited number of kid-friendly amenities are available on request (based on availability). 32" flat-screen TV with more than 60 channels and DVD Player. Featuring a king-sized bed and a separate living room with a king-sized sofa bed, our 64 sqm One Bedroom Suite comfortably lets you experience cozy family retreats in the tropics. Everything around you invites the whole family to relax. 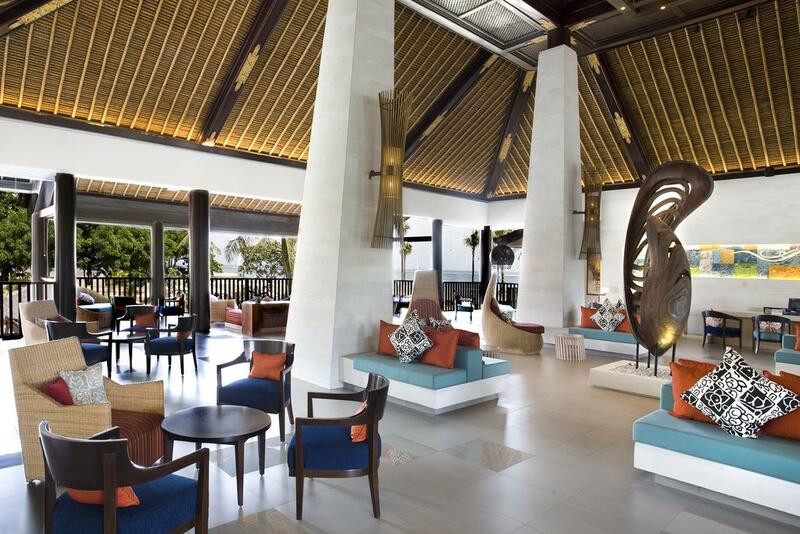 The room is airy with lots of natural light coming through the room-to-ceiling windows, while the spacious private balcony overlooking the marvelous Indian Ocean creates a breezy ambiance which perfectly blends with Bali tropical weather. BEDS : One king bed and one sofabed. OCCUPANCY : 2 adults & 2 children, or 3 adults & 1 child, or 1 adult & 3 children. XTRA BED : One rollaway beds. At our resort Kids Stay and Eat Free*. That’s right, we even have a carefully selected Kids Menu in association with IHG® & Nutrition Australia. 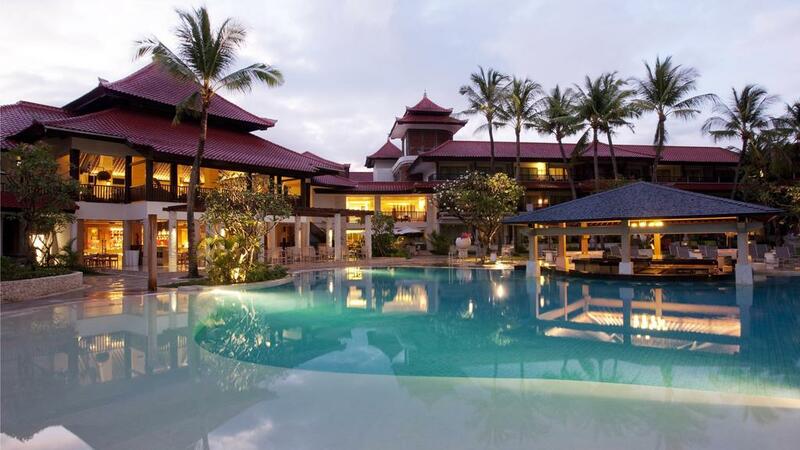 SPECIAL NEEDS : Holiday Inn Resort® Baruna Bali provides limited rooms with accessible features to accommodate guests who need a little extra assistance. A Wheelchair-accessible room equipped with capabilities for guests who are hearing impaired is available on request. Private Terrace with chaise lounge. Offering a plush bed in king configuration, each of these 28sqm rooms feature contemporary decor in the colour of natural wood and vibrant local fabrics. 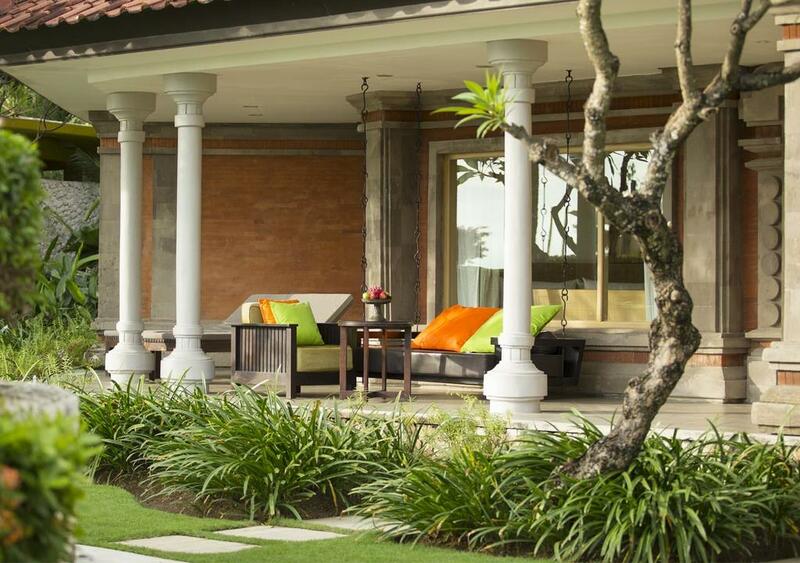 An outdoor private balcony creating a breezy gathering spot to soak up the sunny day. EXTRA BED : Not available for this room type. FOR COUPLES : The cushy chaise lounge on private balcony invites you and your loved one to relax and embrace the calm summer breeze. 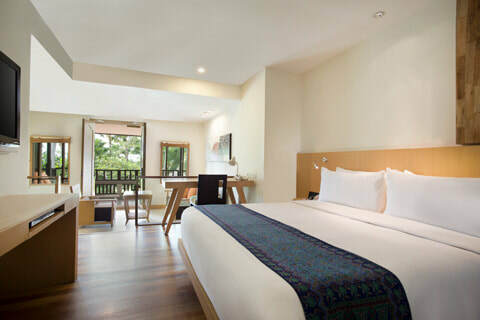 Set amid the resort’s lush greenery, each of these 33sqm contemporary living spaces features plush beds in king and twin configurations and offer easy access to the private balcony extended to our serene garden. The floor-to-ceiling windows allow plenty of natural light pour onto the rooms, while a cushy chaise lounge on the private balcony invites you to soak up in calm summer breeze. Featuring the refreshing view of resort’s serene greeneries, each of these 46sqm contemporary living space is an ideal choice of cozy family retreat in the tropical island. With easy access to a spacious private balcony extended to our serene garden, each room feature a king-sized bed, a sofa bed and a separate bedroom with fortress-like bunk bed and Wii, so the kids can have their own space. 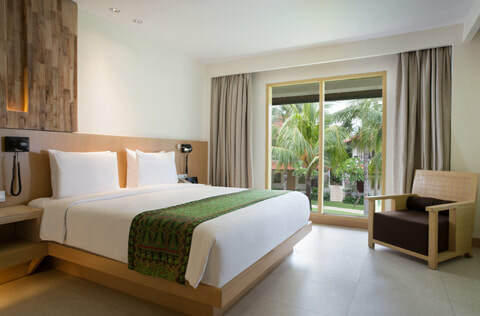 Studio Suite Garden View CONNECTING : Connecting rooms are possible based on availability making Holiday Inn Resort® Baruna Bali one of the best family hotels in Bali. Each of our Junior Suite Garden View offers 60sqm of open floor plan with a king-sized bed and adjacent living area featuring one sofa bed – a comfortable resting spot for the little ones before tomorrow’s fun adventure! 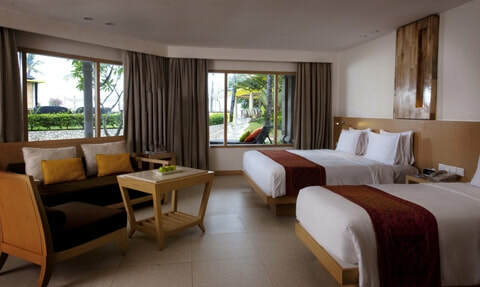 Each suite features a spacious balcony overlooking the resort’s charming tropical garden complete with a cushy daybed which allows you and the kids to spend breezy afternoons with endless fun-filled family moments. BEDS : One king bed and one sofa bed. OCCUPANCY : 2 adults & 2 chldren, or 3 adults & 1 child, or 1 adult & 3 children, or 4 adults. Junior Suite Garden View EXTRA BED : One rollaway bed. CONNECTING : Not available for this room type. Featuring plush beds in a king and twin configuration, each of these 36sqm light-filled rooms is decorated in a chic and contemporary style. Enjoy the breathtaking ocean views from your floor-to-ceiling windows, or soak up in refreshing island breeze at the comfortable chaise lounge in the private balcony. FOR COUPLES : Soak up in refreshing island breeze on the private balcony while admiring the beauty of the sun disappear on the ocean horizon. Featuring plush beds in a king and twin configuration, our Deluxe Garden View rooms features floor-to-ceiling windows that look out onto the resort’s serene gardens, allowing warm sunlight to pour into this 32sqm of contemporary living space. The cushy chaise lounge on private balcony invites you to relax and embrace the calm summer breeze. 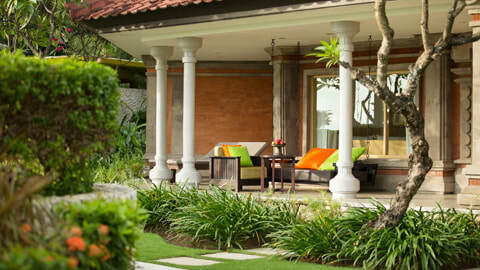 IDEAL FOR COUPLES : Just the two of you, lounging on your private terrace and gazing over our tropical garden. Boasting 52 sqm of living space, our Bigroom Ocean View offers you spacious and comfortable accommodations for the whole family. Featuring a king-sized bed and a single bed in addition to a sofa bed, each room is bathed in natural light through its large glass window. Embrace the warmth of tropical sunshine and refreshing island breeze at the cushy day bed on the private balcony overlooking the marvelous Indian Ocean. 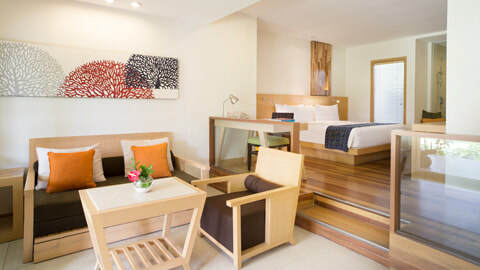 Set amid the resort’s charming tropical garden, our Junior Suite Garden Access offers 60 sqm of open floor plan with a king-sized bed and adjacent living area featuring sofa bed – a comfortable resting spot for the little ones before tomorrow’s fun adventure! Each suite features easy access to a spacious private balcony extended to our serene garden, completed with a cushy daybed which allows you and the kids to spend breezy afternoons with endless fun-filled family moments. BEDS : One king bed and a sofa bed. High-speed internet access around the resort . Children under the age of 12 with parents who stay at the hotel can dine for free (conditions apply). Stay in the best shape of your life with our guests-only fitness center. Featuring both cardiovascular and weight-resistance equipment to accommodate your work out preferences, our treadmills, step climbers, stationary bicycles, weight benches are sure to offer you a satisfying workout. Outdoor exercise classes are conducted based on request. Registered guests have 24 hour key card access to a complete Fitness Room featuring professional grade fitness equipment and amenities at no charge. Incorporating a uniquely new concept in guest convenience, the resort presents its Entertainment Centre, an innovative and open space environment where guests can easily fill up, unwind and have a little fun, all while connecting with each other.